The idea of ‘potential’ is peculiarly captivating for football fans. Perhaps it echoes the optimism and fascination with the future that we felt so strongly in childhood – that time when we first fell in love with the sport. Whatever the reason, players like Jadon Sancho make us feel giddy… and frankly, we at Planet Football don’t have the patience to wait and find out just how good the Borussia Dortmund star will prove to be. 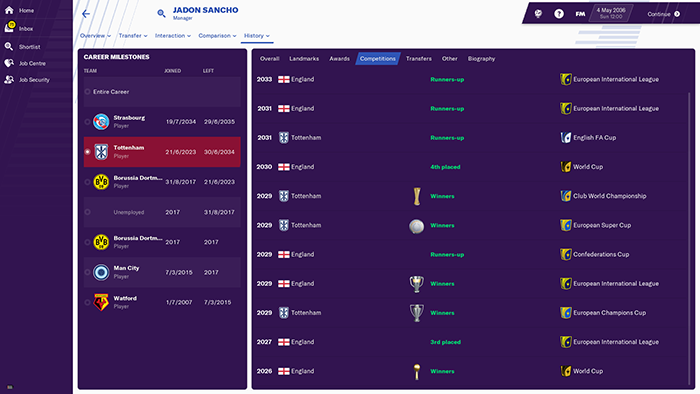 So we took to Football Manager 2019 and simulated 17 years, taking in Sancho’s entire career. Spoiler alert: he does rather well. 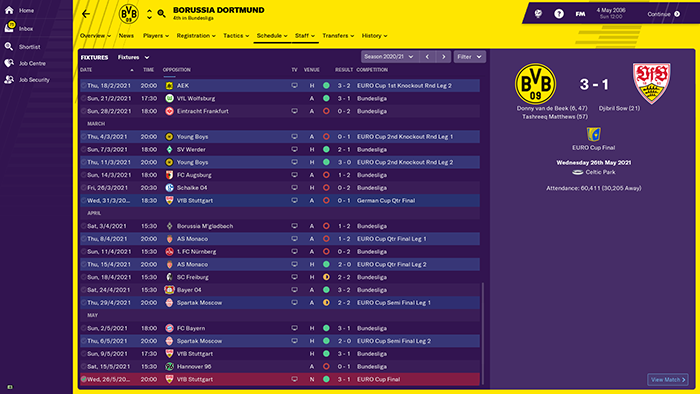 Sancho’s Dortmund career got off to a much slower start than in real life. He spent the first three seasons of the game gradually emerging, playing only a handful of first-team games in 2018-19 before becoming a crucial member of the team (with an average rating over 7.20) in 2019-20 and 2020-21. It was this final year that saw Sancho really arrive on the scene as Dortmund won the Europa League, with the then-21-year-old playing 11 of their games in Europe. But 2021-22 was the season he became a bonafide star. 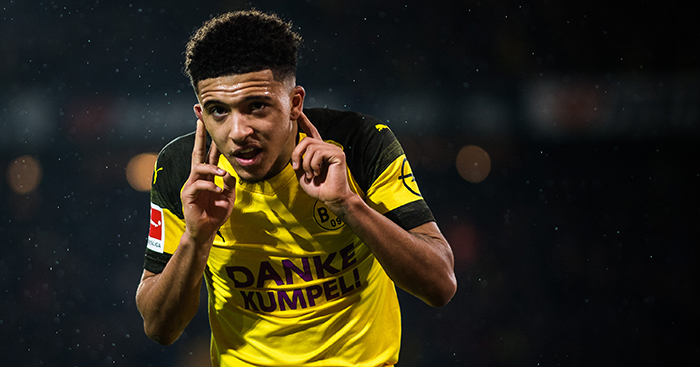 Sancho scored nine goals and grabbed eight assists as Dortmund won the Bundesliga for the first time in 10 years, and the young Englishman won every individual prize going, including German Footballer of the Year. It also happened to be Sancho’s breakthrough year with England, the winger playing a key role for his country on their journey to the World Cup final in Qatar. Sancho’s first ever England goal came in the semis, a 3-1 win over Belgium, but he failed to make an impact as France won the final 5-1. He left the following summer to join Tottenham Hotspur for a club-record fee of £73million. Sancho would retire a Spurs legend after spending 12 years in north London, but more significantly he would retire as one of England’s most prestigious and decorated footballers of all time; it was during his spell at White Hart Lane that a 25-year-old Sancho helped England lift the World Cup, winning the Best Player award for his efforts. 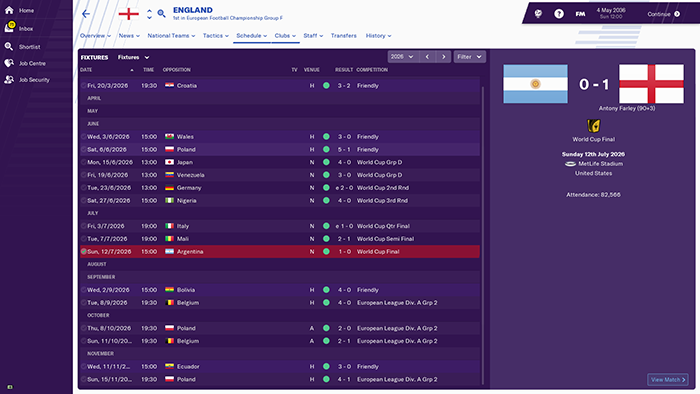 England beat Argentina in the final courtesy of a 93rd-minute winner scored by a re-gen – and Sancho provided the assist. Having gone four years without winning a trophy of any description, the World Cup triumph was again followed by a dry spell for Sancho as Spurs frequently fell just short domestically. By the time he left the club in 2034, Sancho had collected four Premier League runners-up medals. 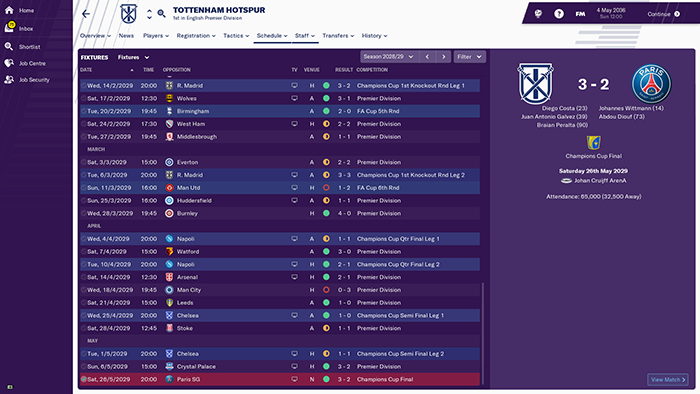 Oh, and a Champions League medal in 2029, Spurs knocking out Real Madrid, Napoli, and Chelsea before beating Paris Saint-Germain 3-2 in the final. This was followed up by winning the Club World Cup a few months later; Sancho may have never played for the best club in England, but at one point he technically played for the best club in the world. When Sancho left for Strasbourg in 2034 he had played 460 matches in all competitions for Spurs, scoring 136 goals and assisting 74 more. For a five-year peak he was regularly hitting double figures in both categories, and on five separate occasions he was voted fans’ player of the year. Legendary status was secure – although the baron years between 2029 and 2034 indicate he peaked pretty early. A solitary year in France’s top flight was entirely without incident: Sancho started just one game and came off the bench another eight times as Strasbourg narrowly avoided relegation. Unsurprisingly, he hung up his boots in the summer. Yes, there are more decorated players in football history and yes, he never quite reached the heights of some of his more distinguished peers. But that scarcely matters. Jadon Sancho not only won the World Cup with England as the tournament’s best player, but he was also a key member of the only Tottenham team to win the Champions League. Not bad. England legends tend to get fast-tracked into management. One year after retirement Sancho became manager of Premier League Burnley, although would only be in charge for nine months. With the club in the relegation zone in April he coldly jumped ship for Brighton, who survived the drop. If you were being kind you’d say Sancho is an ambitious young manager.